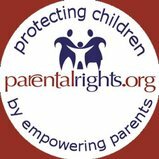 VIOLATION OF PERSONAL RIGHTS and ELIMINATION OF PUBLIC EDUCATION OPPORTUNITIES California's children. HOW COULD THIS BECOME A CALIFORNIA LAW? DETAILED LOOK AT HOW A BILL BECOMES A LAW IN CALIFORNIA. Senator Hernandez abstaining. Ayes: Hall, Mitchell, Monning, Nguyen, Pan, Wolk. Noes: Nielsen, Roth. Opponents coming to the microphone to voice opposition outnumbered supporters by a factor of almost 10:1. APRIL 15: EDUCATION COMMITTEE - VOTE WAS POSTPONED Based on the information presented by expert witnesses, and the follow up questions that Senate committee members could not get answered by the bill’s authors, Senator Pan and Senator Allen, the vote was postponed until Wednesday, April 22, at 9 AM. In the meantime several committee "switched seats" and there are two new faces on the committee for the vote. This bill is likely to pass the judiciary committee. Below is a rough outline of how the legislative process works in CA and what to expect in the coming months for SB277. 2) Senate Floor – If the bill passes out of the Senate Health Committee, it will go to the Senate floor for a full vote. It has to be read and voted on three total times on the Senate floor. One of those has already happened. Second reading is usually the only time a bill will die on the floor but it is not impossible for it to die on third reading. Should the bill get out of committee and the Senate floor second and third reading, it will move to the Assembly side where it will have to be read three times on the Assembly floor and pass out of the committee(s) it is referred to, likely Assembly Health. 3) Assembly Health Committee - It is imperative to get an informational hearing in this committee if one is denied in Senate Health. Otherwise, the hearing will be much like the Senate side hearing with only six minutes of testimony per side and the risk of having everyone show up only to not get to the bill due to time constraints. They hear a lot of bills during a committee meeting. There are too many to have any real discussion. 4) Assembly Floor – Should S277 pass out of Senate Health, the Senate Floor, and Assembly Health, the last stop is second and third reading on the Assembly Floor. If there are no amendments, the bill only needs to get through the Assembly Floor before going to the Governor’s desk. 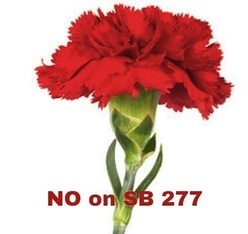 5) Governor’s Signature or Veto – Should SB277 pass both sides and end up on Governor Brown’s desk, the only way to stop it is to convince Governor Brown to veto the bill. 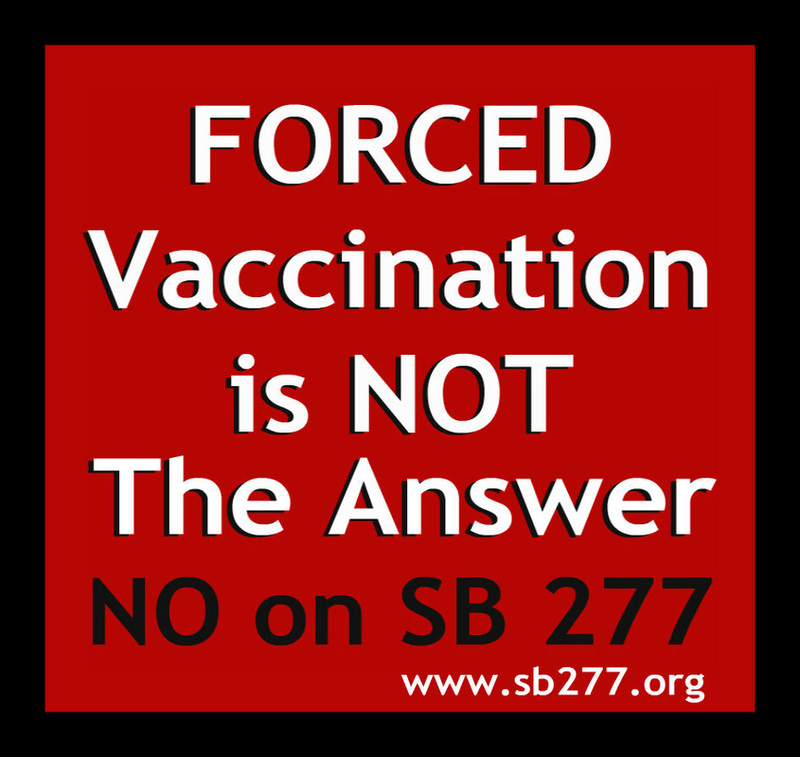 find out more : SB 277? You Don't Get To Vote! • No public health crisis. • Creates public education crisis. • High vaccination rates in California. • Small percentage claim PBE. 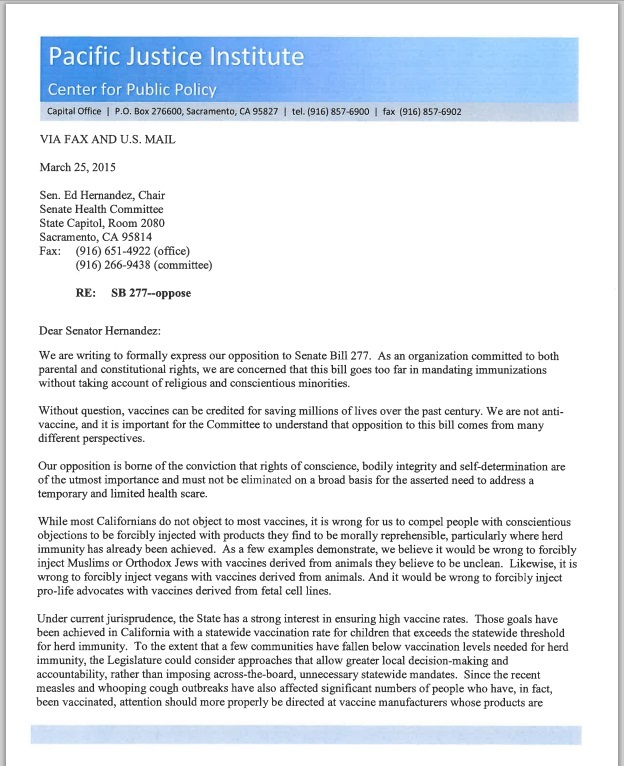 • Religious rights violated by SB277. • Discriminates against low income, single families. • Creates separate but unequal education in violation of Brown vs. Education. • Selectively vaccinated counted as "unvaccinated". 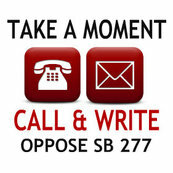 • SB277 pits two constitutional rights against each other. • Places the right of public education of a small number of students with medical exemptions (0.019%?) above the larger number of students with PBE (2.5%). • Public schools are not the only place children congregate regularly. • No "compelling state interest" of magnitude of smallpox vaccination. • Limits homeschooling to family members only. • Allows adding unlimited vaccines without the checks and balance of the legislative process. • Removes personal freedom and subjects citizens to government mandates. • Forces children out of the education system based upon personal beliefs. • No evidence of harm threshold met. • Infinitesimal risk to the vaccinated children and small number of medically exempt children. • Less restrictive educational solution needed. • Throws thousands of kids out of school without providing fiscal alternative for eduction. • Violates IDEA and denies access to special education for children with disabilities. 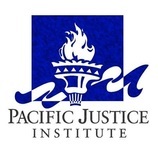 • Would the state be required to provide private tutors? • Removes Governor Brown's Executive Order granting Religious Exemption. • Provides no separate religious exemption.